Yay for the shoutout! That is a gorgeous card! I love this Valentine too. 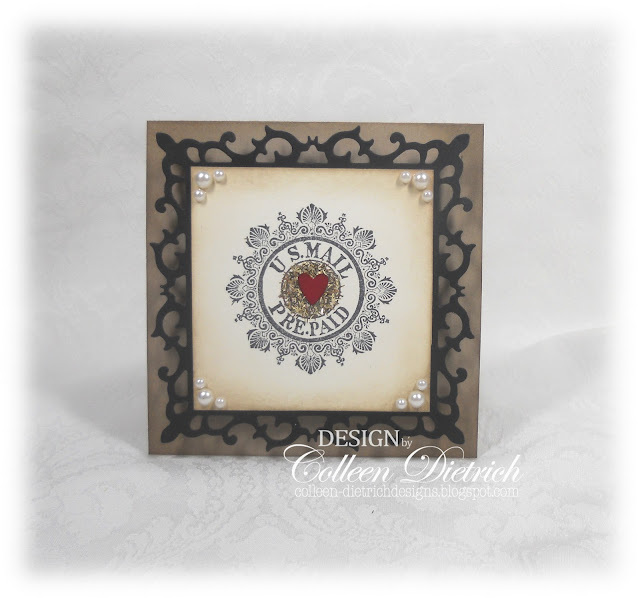 What a great stamp set and the glitter and heart take it to a whole new level. Yum, GS Cookies are a favorite in our house. Love your Valentine! The camouflage glitter is genius! And I'd like to have you as my personal shopper - you scored some major buys! I love how you transformed your card into a Valentine! Clever! So elegant! Congrats on your shout out! Way to go with scoring the crafty goods! Boy, I am exhausted just reading about all your activity! Congrats on the valentine collage news! Cookie sales, gee I have some funny stories about selling them too when I was a kid and other selling strategies! I would love to go shopping with you! I never have time to go to these stores when in Des Moines. After I hit Michaels and Barnes & Nobles with lunch in there, the day seems to be shot. Maybe I figure out a different strategy for shopping. Those are some fun finds! Now this valentine is soooo cute! I love the heart in the middle but those pearls throw it over the top! It is so fun and what a great card with those stamps! 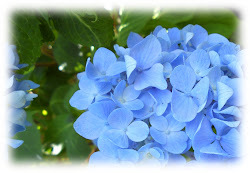 Now, please take a much needed break and just relax for a bit - you are making me feel so guilty! SO elegant, Col! I loved seeing your bargains, too. :D!! Love this Colleen, it's not the "usual" Valentine and that's what makes it so special! What fabulous bargains you've gained girl ;) And those girl scout cookie sales...you're on a roll! Love the nestie you used to frame the focal image on the card. Very elegant and a great colour combo. Well done on the cookie selling :) I'm into the "Fall collection" (i.e. mint) and get them every year. Good luck with your submissions. You've inspired me!! 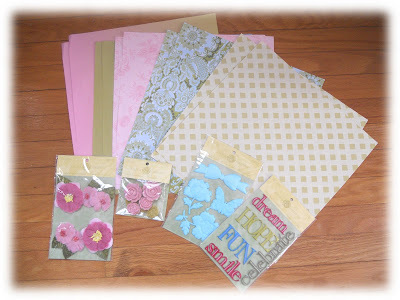 I'd love for you to link up with my cardmaking meme, 52 Card Pickup. You hit the jackpot at Tuesday Morning! Love the card, such a good idea to make into a valentine, and I love the frame you've used. I can't believe your daughter has 100 boxes to sell on her own, that's crazy!!! 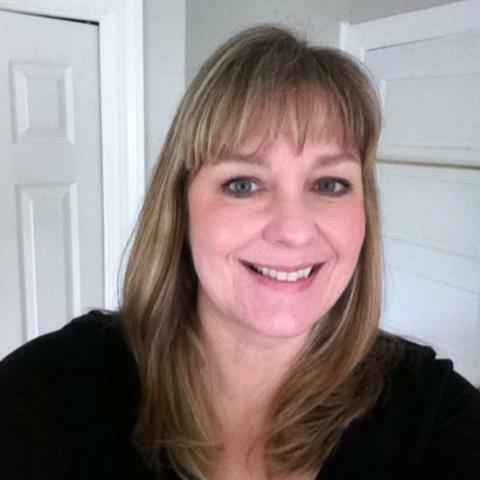 You need to share your fundraising tips!!! This is stunning! 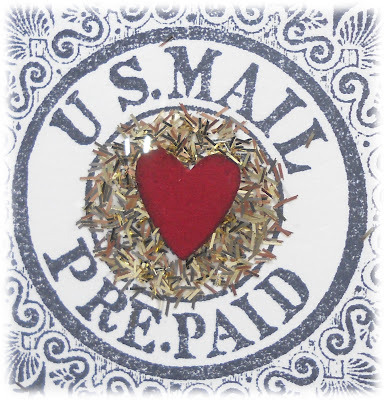 Love that delicate medallion stamp!!! Where is there a Tuesday Morning still around here? I tried to go to the Mt. Laurel one a few weeks ago and it was shut down. Gorgeous card Colleen!! Love the neutral colors and then the red heart in the middle. That tinsel glitter adds a great little sparkle too. Beautiful card! The pearls add such an elegant element to your lovely design. Looking at your card I immediately said; oooooooh. Yes this is right up my alleye. I love the "old"look and that centerpiece is stunning!! And your shopping??? Great bargains. Well done sweetie! Wow! I am a bit jealous of your wonderful bargains! I can't believe you picked those stamps,up for $1! That's about 60p!! Well done on your bargains, I can't wait to see what you make with them! 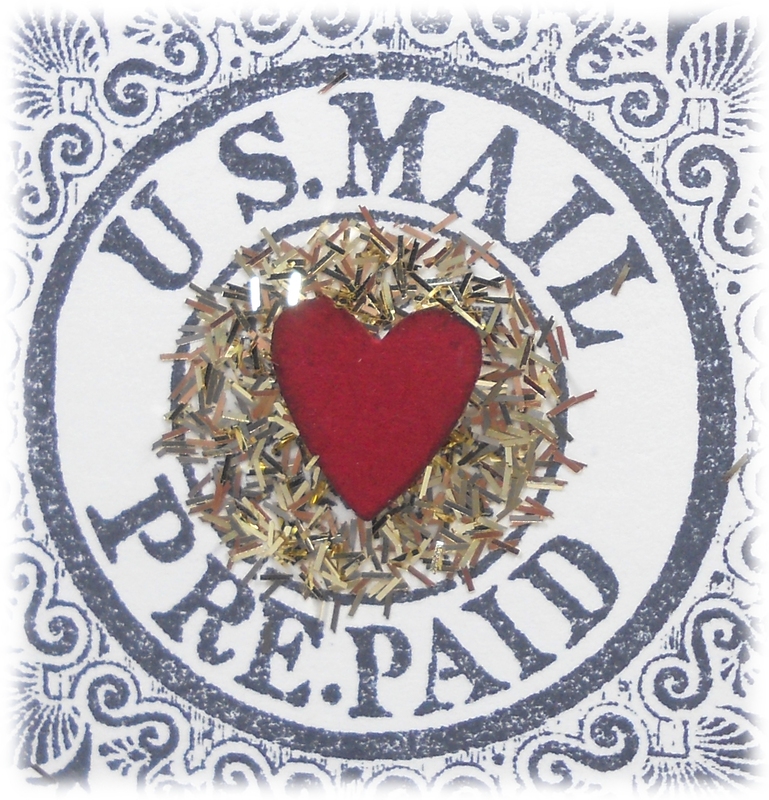 Love your valentine card too, a great CAS design, but with a lot of interest, that tinsel glitter is so pretty! Colleen I just love this medallion. How pretty it is. I love what you did to make it more festive for Valentines day. Just gorgeous. Hey I want to go shopping with you-all our Tuesday Mornings are gone-sounds like you scored on some great deals!!! 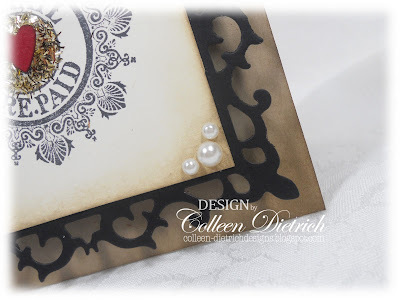 wow this is so beautiful.I love that die cut frame and fun stamps...so pretty together..
How beautiful Colleen...love the gorgeous earth tones, the soft soft sponging and of course, the perfect pearls! That splash of red is just striking! Way to make these stamps look awesome! Very elegant Colleen! Love your colour choices and use of the Fleur De Lis mat. Really beautiful!